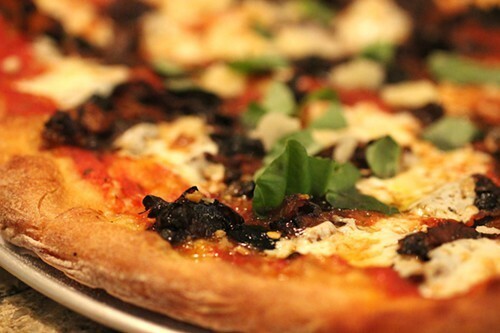 Is Chicago's next great pizza at Floriole on Friday nights? For a brief moment, it was the gold standard of pizza in Chicago, even in America (if you listened to Alan Richman). Great Lake labored mightily over a richly flavored, slow-rising crust—close to but not exactly Neapolitan, and topped with impeccably flavorful things mostly straight from the farmers' market. And then it was gone and, despite predictions at the time, likely to stay that way. 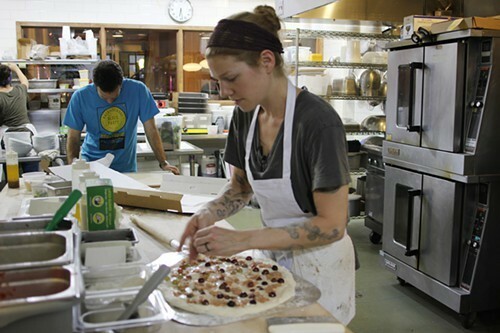 But someone else with a reputation for good baking and farmers' market ingredients has been quietly honing their craft at pizza making since May, hand-making well-composed specialty pizzas on Friday and Saturday nights (which will become Fridays only in November). It's Floriole Cafe & Bakery in Lincoln Park, specifically baker Rachel Post, who owner Sandra Holl says was "Floriole's very first employee." Post joined Floriole when it first sold baked goods at the Green City Market and worked out of the incubator Kitchen Chicago, and established herself as Floriole's top bread baker (including the small "pizzettas" they served for lunch). 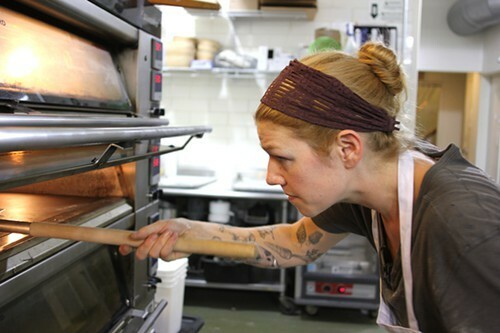 "She has a really good handle on crust and everything associated with bread," Holl says. The crust is basically the same as Floriole's baguette dough, with a little milk and olive oil but, Post says, the main difference is that the crust doesn't have the starter that's in the baguettes. Like baguette dough, it comes out of the oven with a hard exterior and a bubbly interior. "It's crispy and chewy at the same time, but not superthin like Neapolitan pizza. Or crazy thick, like Chicago pizza," Holl says. You can order whatever you want of the ingredients on hand on a pizza, but the emphasis is on three special pizzas each week— a simple red pizza (basically a margherita), a red pizza, and a white pizza, all using local ingredients. In the summer these changed every two weeks as things at the markets changed rapidly, and included combinations like corn and shishito peppers, but Holl says they'll change only monthly in the winter. The specialty pizzas are artfully composed combinations, using not only toppings like Klug grapes or eggplant caponata but taking advantage of regional cheeses such as Sarvecchio and Dante, both from Wisconsin. 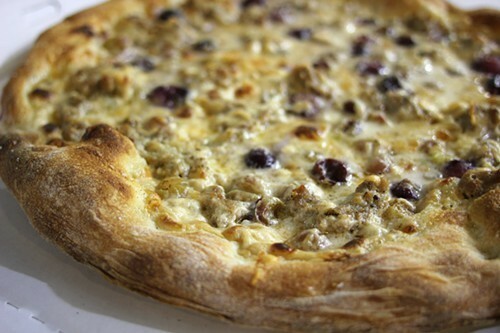 The white pizza, which also has sausage and a hazelnut-based bechamel, is especially complex and interesting. The pizzas reward curiosity but also, it must be said, patience—Post is almost the only one making them (she gets some help with the final dressing of baked pies) and a rush of customers around 6 PM backed up the oven and her ability to hand-make each pie for a good hour. 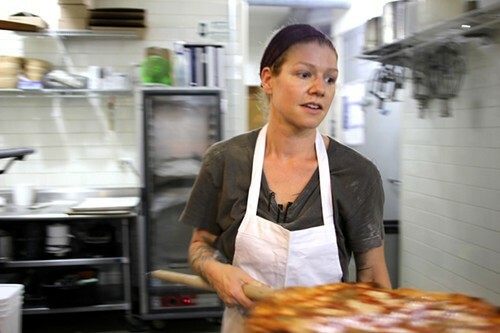 But the ultimate goal is a spin-off pizza restaurant with a full kitchen and staff of its own— "somewhere, a year or two down the road," Holl says. After a few years at Floriole, Post approached Holl about a business of her own, so they decided to use Floriole as the incubator for a restaurant combining Post's pizzas with Holl's ice creams. Holl also tests out a different flavor or technique each Friday night, usually a composed ice cream dessert with some kind of roasted fruit or other elements—though last Friday she wasn't serving it at Floriole, because everything she made was going to the Pilot Light fund-raiser at Publican Quality Meats. So how far away is their full-fledged pizza-and-ice-cream business? "Hey, if you hear of a good space, let me know," Holl says. "Right now we're in the stage of, 'Would this work, how would we do it?' We're lucky enough to have a place where we can play around with it every week."